Penetrates the hair fibre thanks to the Nano-Emulsion and Ionium technology. An immediate and lasting result. An ultimate treatment to offer dual action for the entire fibre: cortex, curticle and surface. Intensive and instant nourishment right from the cortex to the surface of the fibre. Lasting softness and shine along the length of the hair. Long-lasting protection against the drying effects of harsh external elements. Towel-dry the hair thoroughly.Apply the Oleo Fusion section by section, and massage into the whole length of the hair. 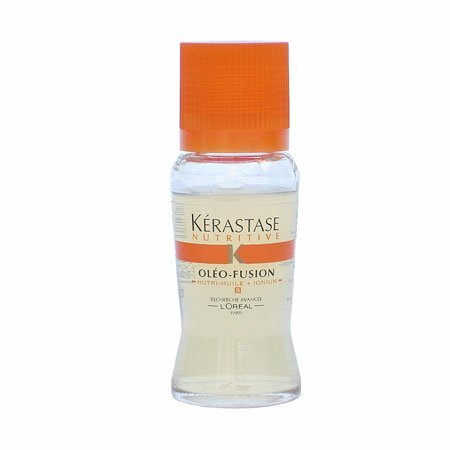 While the Oleo-Fusion is acting, comb each section and pay particular attention to most dry and sensitized areas. Let it stay for a 3-5 minutes then rinse your hair.Lasts up to 5 shampoos.